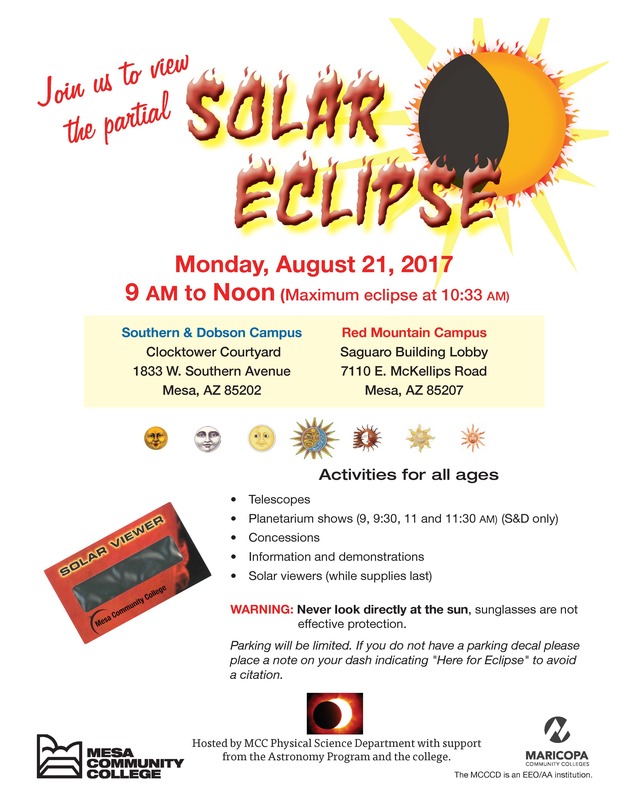 MESA, Arizona – August 8, 2017 – Mesa Community College is hosting solar eclipse viewing parties on both of its campuses from 9 a.m. to noon on Monday, Aug. 21 . A majority of the activities at MCC’s Southern and Dobson campus (1833 W. Southern Ave., Mesa) occur in the Clock Tower Courtyard near the center of campus. Guests visiting the MCC at Red Mountain campus (7110 E. McKellips Rd., Mesa) should meet in the Saguaro building near the terrariums. Solar viewing glasses are being provided while supplies last. The maximum solar eclipse, 60 percent, occurs at 10:33 a.m.
Activities, including solar telescope viewing of the eclipse and make-it-yourself solar viewers, are planned throughout the morning along with concessions, information and demonstrations. Southern and Dobson campus only: Free planetarium shows at 9, 9:30, 11 and 11:30 a.m. Parking is limited. If you do not have a college parking decal, please place a note on your dash indicating “Here for Eclipse” to avoid a citation.